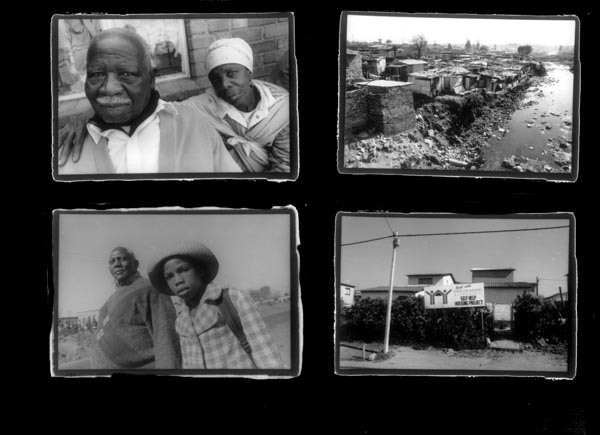 The look and feel of rebuilding the post-apartheid South Africa is the theme of this exhibition. 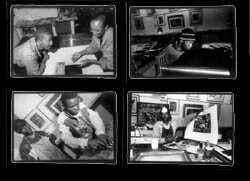 The photographsmade mostly in townshipsshow people working toward a new nation, one that has recently experienced a largely nonviolent transformation. People now struggle with poverty, crime, HIV-AIDS and other afflictions, some of them residues of the past, some a result of new global economic forces and structures. In townships such as Alexandra, Evaton, Oukasie, Soweto, and Manenburg, as well as cities like Cape Town and Johannesburg, stalwart people, many of them persecuted during the freedom struggle, now seek a new liberation: a just, peaceful, and fruitful life. Skip Schiel was in South Africa for four months in 1999. He was completing his participation in the year-long Interfaith Pilgrimage of the Middle Passage, retracing the journey of the trans-Atlantic slave trade. The Pilgrimage (with Reverend Desmond Tutu as its honorary advisory board head) had ended in South Africa to honor and learn from a country with a surprisingly parallel history. 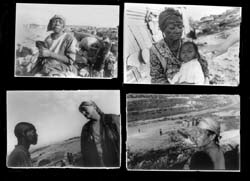 Offering his photography free (in exchange for lodging and food, where possible) to organizations helping rebuild the nation, he gained invaluable access to some of the current struggles. The photographs offer a glimpse of an enthralling story. The Artist Proof Studio, co-founded by Kim Berman, teaches printmaking and papermaking to black artists from impoverished communities. Studio members coordinate South Africas national Paper Prayers campaigna program of educational and cultural events to raise awareness of HIV/AIDS. Phutadichaba Qoqizizwe, directed by (Mr.) Linda Twala, operates a health clinic, community center and meals-on-wheels program for elderly people in Alexandra township. Maybe youve heard about Alex, as its known, some 3/4 million people, all black, stuffed into one square mile. Like Soweto, but not as well known. 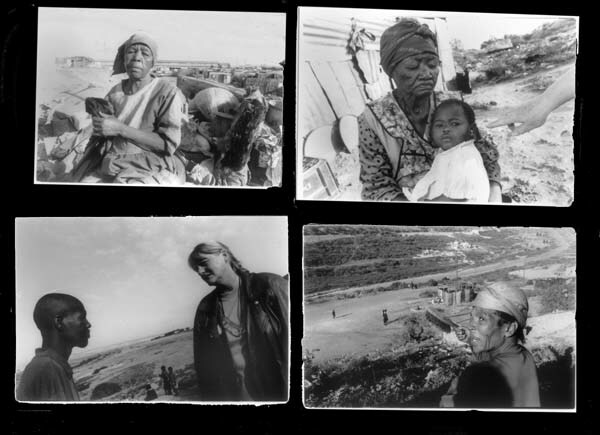 The apartheid government some 20 years ago attempted to forcibly relocate the inhabitants. They resisted, and valiantly at that. A highlight of my experience was befriending a 12 year old orphaned boy, Freddy Nonkanyana, who was traveling with my guides. He insisted on carrying my knapsack, dutifully, so as a little surprise I offered him my giant Nikon to try out. Right in the middle of about 80 people. He seemed to love the chance, snapped a few, and then we were buddies. Id shift cameras to him, let him fly. Hed suggest shots to me. I showed him everything I was doing, teaching, encouraging. He led me around the neighborhood, translated, explained. If anything good visually comes of this experience, in large measure its due to Freddy. This is the Aloes Community, near Port Elizabeth, South Africaa thriving industrial city on the beautiful Indian Ocean. But the residents of Aloes taste, smell, see and absorb industrial detritus. Highly toxic leachatea soup percolated from the remains of a myriad of industrial processesis trucked here. It seeps and evaporates from holding pits into the surrounding earth and atmosphere. Aiding the residents, calling for the closing of the pits, are various citizens fostering dialog between waste-site managers and neighbors. They are the Zwartkops River Trust, led by Joan Coutledge and supported in the United States by the South African Exchange Program on Environmental Justice (www.igc.org/saepej/). The photos I tried to make, usually hurriedly, show young people dying of cancer, children with the tell-tale (in this case) runny nose of tuberculosis, the widow of an environmental activist who recently succumbed to what many feel were toxins in his water and air. His name: Nelson Fezi, leading the community struggle to close the medical waste incinerator and the Aloe toxic waste sites. The odor here from the Aloes waste sites reeks of sulfur and other noxious chemicals generated by a substance called "leachate"a conglomerate of waste products leaching thru the soil. Some 60% of this foul substance emanate from the local tanneries. At the community of Ibayi, for some 15 years built on a primary landfill for Port Elizabeth, residents have constructed their shanty homes on garbage. Methane seeps up from the decomposing wastes and could cause explosions. Presently, only so-called "clean waste" is dumpedgarden waste and building materials. Men rummage for bricks and wire that they can sell. In my photos I show the workers, the shanty residents, their homes, and boys playing soccer. Two women stopped usJoan and I were being escorted by Nothi Tabata, director of the local Community Environmental Networkand asked angrily: we want to see those photos! They explained that too often folks like me make photos, promise prints, never send them. Investigators sample chemicals, formulate recommendations, and yet not much changes. We promised the photos.